As the daughter of Guyanese immigrants, I have experienced the conditions of the fledgling tourism industry in Guyana firsthand and know it leaves a lot to be desired. I have also witnessed its unique offerings for adventure travelers and can see it has great potential. 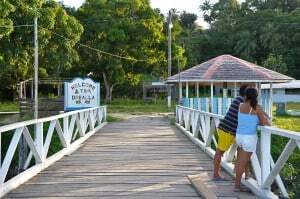 The sleepy village of Orealla in Guyana welcomes visitors and tourists. Photo: Devika McWalters. A recent report by the Inter-American Development Bank (IADB) echoes this view and also signifies an important “make or break” point for destination stewardship in this eco-rich country. The December 2015 report, “Tourism and Ecotourism Development in Guyana: Issues and Challenges and the Critical Path Forward”, provides a thoughtful and comprehensive overview of the current situation, potential for growth, and main obstacles facing this undiscovered ecotourism destination on the northern coast of South America. 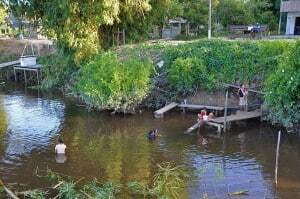 Guyana’s indigenous communities rely on its clean rivers for survival. Tourism may create jobs but raises concerns about pollution and disruption of their daily lives. Photo: Devika McWalters. Unfortunately, the danger of this well-meaning report is that it fails to provide a stewardship framework. There are many issues investors, policymakers, tourism companies, residents, and other stakeholders need to consider before acting on the report’s suggestions, one of which is improving the quality of lodging and transportation links. 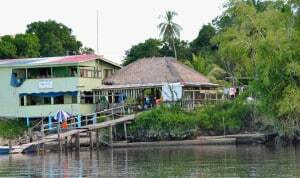 Guyana’s ecolodges can be difficult to access , such as the Orealla Guest House, which takes several hours to reach by private boat. Photo: Devika McWalters. My parents and I once visited the Orealla Guest House, located in a small village some 50 miles south of the Atlantic coast and accessible only by boat. Building highways to reach such eco-lodges and natural attractions seems like an obvious solution for improving accessibility, but ultimately, is doing so at the expense of clearing rain forests and destroying the fabric of this peaceful, pristine environment worth it? What will happen when the indigenous peoples – the current stewards of these lands – are forced to move when their rivers and streams are overfished or polluted by nearby hotels and lodges? How will the environment and wildlife be affected by noise and disruptions caused by new airports and runways? These issues are not raised, nor are other proactive measures or safeguards offered for stakeholders to consider while conceiving new tourism policies. 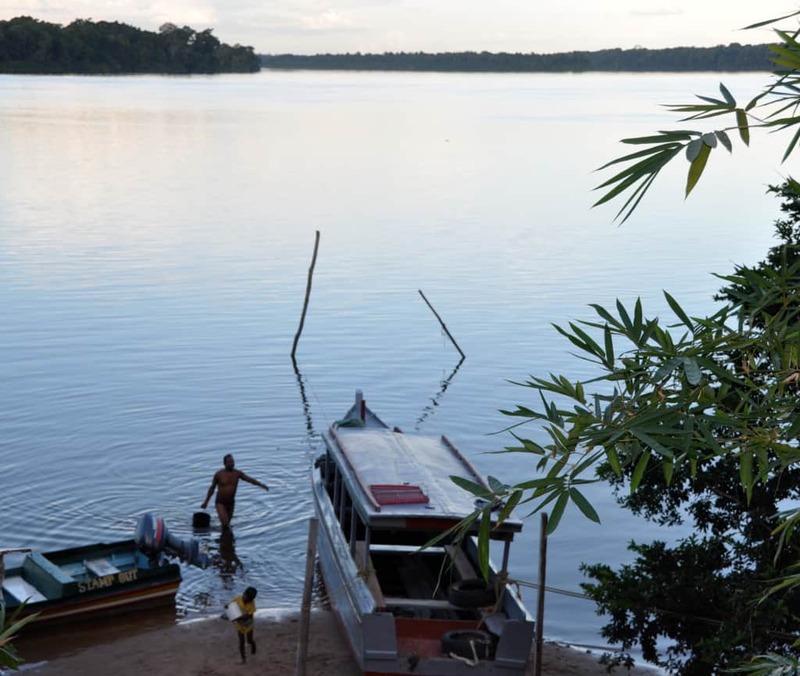 Amerindian residents of Orealla, Guyana are concerned about how tourism will affect their remote and peaceful village. Photo: Devika McWalters. Gather and analyze data to inform policies. Engage stakeholders in creating a master development plan based on social, economic, and financial analysis. Create a logical and coherent legislative, regulatory, and policy framework. Build core capacity for and assist as many stakeholders as possible, improve and classify lodging infrastructure, and upgrade and strengthen the entire tourist value chain, while maximizing scarce resources. Continually work on improving price competitiveness and marketing its value propositions. As the title of the report acknowledges, the path forward is “critical” for Guyana’s tourism. But it’s not just a matter of improving attractions, transportation, hotels, and restaurants. It’s which path and how Guyana chooses to get there that is critical. The next steps Guyana takes in building its tourism industry will ultimately determine its long-term sustainability and success as place where people will want to visit, live, and return to. Guyana’s natural resources, cultural heritage, and future generations will all be affected as tourism grows. Photo: Devika McWalters. A thoughtful, holistic tourism plan that protects its pristine rivers, indigenous cultures, vast rain forests, wildlife, and other assets would not only provide additional opportunities for economic growth, but would also preserve Guyana’s national treasures and tourism industry for generations to come. For Guyana become a permanently successful destination, practical solutions that also preserve the very assets that make it desirable must be encouraged and adopted. I worked at National Geographic for 12 years. I am personally very interested in promoting destination stewardship and sustainable tourism. This entry was posted in Stewardship and tagged cultural tourism, ecotourism, geotourism, Guyana, Levy, rural tourism, sustainable development by Devika McWalters. Bookmark the permalink. A very good article. Hope the Guyana Government and Tourism department would study it carefully and act accordingly. Guyana certainly has great potential for those whose like adventure in the wilderness.